Yesterday was marvelous as we in Use Offot congregation here in Nigeria sang songs of praises to appreciate and thank God for your very successful fund raisers of last Sunday. A visiting song teacher who came yesterday remarked that everybody was so happy about the success story so the good songs so selected and rendered gave God the glory. About 2hours was devoted for the songs. We also prayed for you, elders and other persons who from inception has contributed to the success of the program. Thereafter the committee had a meeting that lasted over 2 hours and from there we went to inspect another land since the one we saw had since been sold out by the owner. After the inspection, the 7 of us unanimously agreed that we should pay for it immediately so that the man will not sell it like the other one did. Today we have contacted a lawyer to put up a power of attorney. We shall part-pay him and complete the balance thereafter. For that reason, we have suspended the proposed procurement of tools in order to buy the land first. When money is sent to us we shall start buying starter packs. We re-fix September to give out the tools to trainees. On request by one congregation near a creek "Obio Usiere" very far away from here and near a river, we had decided to visit them on 3rd Sunday of June by God's grace. We shall leave here by 5.am to worship there. After that we shall evangelize the area then visit a family of a widow whose husband (we are informed), suffered so much to get the congregation established there some years ago. We shall thereafter to return by night. Some photos will be sent to you if possible. 1st Sunday of July had been fixed by the committee in consultation with the church to donate food stuff as usual for sharing to orphans and widows in our congregation. Two former trainees Sis Nkoyo(photo no. 68) and Sis Ndaeminti( photo no.76 have put to birth. Ndaeminti also gained admission into a university to study English language. Her husband is the one to sponsor her and since it is a part time program she will be sewing in her workshop after coming back from lectures. We shall send photos any time they visit us. These are some of the photos that a brother in the congregation too yesterday during our worship. Thank you and may His continued blessings be yours in Jesus name. Once again I bring to you Calvary greetings in Jesus dear name. I hereby present these two(2) photographs to you. Photo 1: shows one of the earlier trained orphans – sister Blessing (hair-dresser).She recently got married to one brother Stephen in a congregation far away from here. We as a committee where invited and we all attended the ceremony. She and the husband are seen in the middle of the photograph. Remember Sister Blessing is an orphan of both parents. God visited her with a dedicated and industrious brother who is a welder. Photo 2: This shows a female trainee – Abasi-anam (in white blouse). She was one of those we picked up from Leprosy hospital for training last year. She is seen seated at the far right. She was one of those whom we visited last Tuesday. The hospital secretary is seated by the left. This goes a long way to show what the Lord has done to orphans and widows who had no hope in life. To God be the glory that we successfully completed the exercise yesterday. A total of 16 persons came in for the interview. They were accompanied by either their ministers, church secretaries or guardians. We started interacting with them shortly after worship at noon but finally closed at about 4.00pm in the evening. We selected eight (8) of them for this year’s training. Out of this number, I have personally decided to pick up two (2) of them to fully train and also equip. I do this in showing just a little appreciation my God for always answering my prayers, strengthening my faith in Him and blessing me wonderfully. A sister in this congregation in her text message to me last night has promised to train and also equip one of them. Her message reads “Happy Lord’s day brother. I want to thank you for your prayers and that of the church for my mum. I want to task myself again by training and equipping one of the orphans”. This family did that some years ago and am hopeful that they will do it again. The remaining five (5) of them will therefore be trained by AtMyGate programme. We announced to them yesterday and also wrote in the letters sent through them to their congregations that training starts immediately this week. Attached herewith are some photographs that were taken right there. As usual, I will send their names and pasted passport photos to you soon. 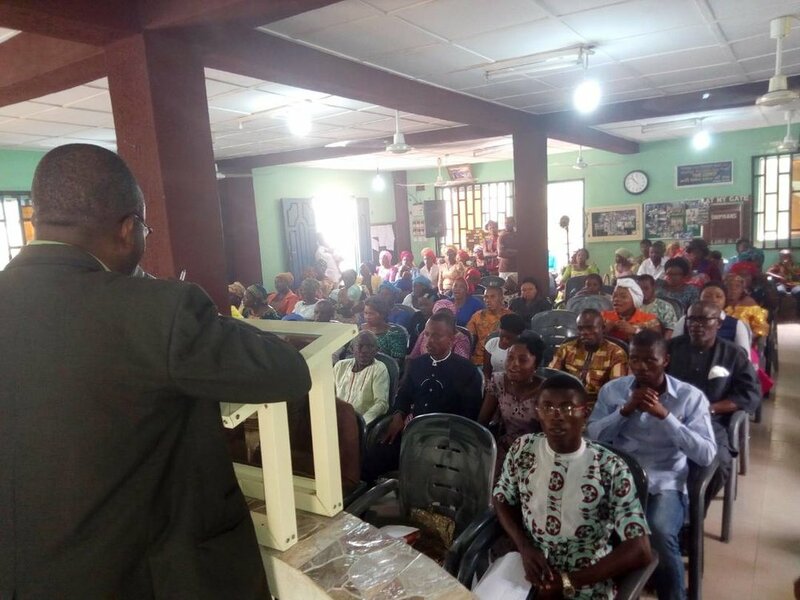 We remain sincerely grateful to Norfolk Church of Christ for impacting so positively in the lives of these orphans and widows in this country – Nigeria. You will all be rewarded.